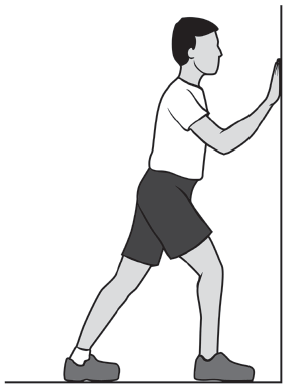 > Keep both heels at on the floor and press your hips forward toward the wall. > Hold this stretch for 30 seconds and then relax for 30 seconds. Repeat. Main muscles worked: Quadriceps. You should feel this stretch in the front of your thigh. > Hold on to the back of a chair or a wall for balance. > Bend your knee and bring your heel up toward your buttock. > Grasp your ankle with your hand and gently pull your heel closer to your body. > Hold this position for 30 to 60 seconds. > Repeat with the opposite leg. Main muscles worked: Hamstrings. You should feel this stretch at the back of your thigh and behind your knee. > Lie on the floor with both legs bent. > Lift one leg off of the floor and bring the knee toward your chest. > Clasp your hands behind your thigh below your knee. Main muscles worked: Quadriceps, gluteus, hamstrings. You should feel this exercise at the front and back of your thighs, and your buttocks. > Stand with your feet shoulder distance apart. Your hands can rest on the front of your thighs or reach in front of you. If needed, hold on to the back of a chair or wall for balance. > Keep your chest lifted and slowly lower your hips about 10 inches, as if you are sitting down into a chair. > Plant your weight in your heels and hold the squat for 5 seconds. > Push through your heels and bring your body back up to standing. Main muscles worked: Hamstrings. You should feel this exercise at the back of your thigh. Equipment needed: As the exercise becomes easier to perform, gradually increase the resistance by adding an ankle weight. Begin with a 5 lb. weight and gradually progress to a greater level of resistance, up to a 10 lb. weight. If you have access to a tness center, this exercise can also be performed on a weight machine. A tness assistant at your gym can instruct you on how to use the machines safely. 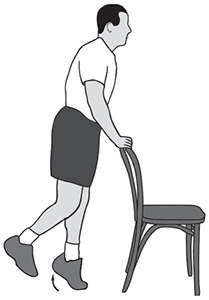 > Hold onto the back of a chair or a wall for balance. 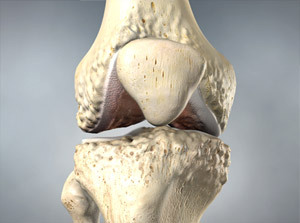 > Bend your affected knee and raise your heel toward the ceiling as far as possible without pain. > Hold this position for 5 seconds and then relax. Repeat. Main muscles worked: Gastrocnemius-soleus complex. 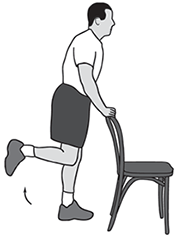 You should feel this exercise in your calf. > Stand with your weight evenly distributed over both feet. Hold onto the back of a chair or a wall for balance. > Lift your unaffected foot off of the oor so that all of your weight is placed on your affected foot. > Raise the heel of your affected foot as high as you can, then lower. Main muscles worked: Quadriceps. You should feel this exercise at the front of your thigh. Equipment needed: As the exercise becomes easier to perform, gradually increase the resistance by adding an ankle weight. Begin with a 5 lb. weight and gradually progress to a greater level of resistance, up to a 10 lb. weight. If you have access to a tness center, this exercise can also be performed on a weight machine. A fitness assistant at your gym can instruct you on how to use the machines safely. > Sit up straight on a chair or bench. 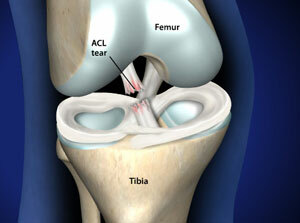 > Tighten your thigh muscles and slowly straighten and raise your affected leg as high as possible. > Squeeze your thigh muscles and hold this position for 5 seconds. > Relax and bring your foot to the floor. Repeat. shoulders to support your upper body. that your foot is at on the floor. raise it 6 to 10 inches off the floor. your leg to the floor. Repeat. Main muscles worked: Hamstrings, gluteus. You should feel this exercise at the back of your thigh and into your buttock. straight. Rest your head on your arms. affected leg and raise the leg toward the ceiling as high as you can. > Hold this position for 5 seconds. > Lower your leg and rest it for 2 seconds. Repeat. Main muscles worked: Abductors, gluteus. You should feel this exercise at your outer thigh and buttock. bottom leg bent to provide support. your knee straight, but not locked. > Slowly lower your leg and relax it for 2 seconds. Repeat. Main muscles worked: Adductors. You should feel this exercise at your inner thigh. > Cross the uninjured leg in front of the injured leg. > Raise the injured leg 6 to 8 inches off the floor. > Lower your leg and rest for 2 seconds. Repeat. Main muscles worked: Quadriceps, hamstrings. You should feel this exercise at the front of your hip, and the front and back of your thigh. 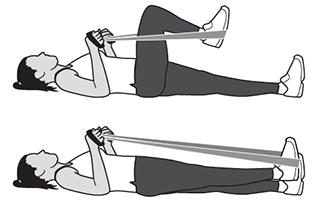 Equipment needed: This exercise is best performed using an elastic stretch band of comfortable resistance. 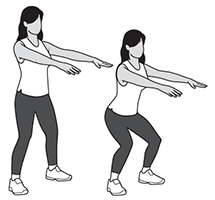 As the exercise becomes easier to perform, gradually increase the level of resistance. 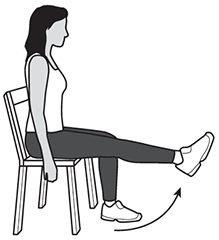 Do not use ankle weights with this exercise. If you have access to a tness center, this exercise can also be performed on a weight machine. A tness assistant at your gym can instruct you on how to use the machines safely. hold the ends in each hand. Lie on the floor with your elbows bent. > Flex your foot and slowly straighten your leg directly in front of you, pushing against the elastic band.